Last Friday, I found out that The Emily Jerry Foundation’s Guardian Angel Pediatric Safe Label Program and our partnership with Medi-Dose had the following article appear in Surgical Products Magazine. It seems that our important new program is off to a very good start! Problem: Because of their small size, pediatric patients are particularly vulnerable to medication errors. An error that might have minimal effect to an adult could be catastrophic to a child. 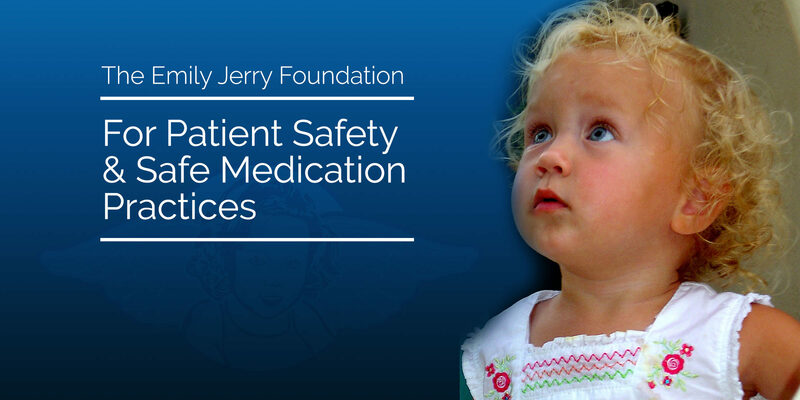 Solution: To help promote awareness of this issue, Medi-Dose/EPS is working with the Emily Jerry Foundation to incorporate their Blue Angel warning logo into its MILT 3.0 software. The Emily Jerry Foundation is determined to help make medical facilities safer for everyone, beginning with our babies and children. The foundation focuses on increasing public awareness of key patient safety related issues and identifying technology and best practices proven to minimize the “human error” component of medicine. On December third of last month, Michael Cohen, the President of the Institute for Safe Medication Practices (ISMP), Eric Cropp, and myself, had the opportunity to share Emily’s tragic story and the important lessons that have been learned from the medication error that took her life in 2006. The day began with a wonderful keynote speech from former President Bill Clinton, titled “Embracing our Common Humanity”. During his speech President Clinton shared his philanthropic worldview and the very important humanitarian work that is being accomplished globally by the William J. Clinton Foundation. In my opinion, President Clinton’s speech was the perfect way to kick off the ASHP Midyear! As he was describing the inherent challenges of globalization, he really emphasized the growing interdependence, the people of the world now have on one another, as we all move forward into the future. He attributed this growing interdependence on the fact that much of the world’s population shares very similar goals and values. With that being said, as he spoke, I began drawing analogies to patient safety and quality of care in our nation’s medical facilities. The primary one being, just like many of the people of the world share the common goals and values President Clinton described in his speech, caregivers like physicians, nurses, pharmacists, pharmacy technicians, etc., also share many similar core values and common goals relating to patient safety overall. Later that day, we gave our presentation before more than 2,500 people, entitled “The Emily Jerry Story: Lessons Learned From a Fatal Medication Error”. The reason I feel our presentation received a standing ovation is simply due to the fact that most of the audience was comprised of pharmacists from around the United States, who all share very similar values and exactly the same common goals when it comes to medication and patient safety. Bottom line, I believe every member of the audience was helping me honor my beautiful daughter Emily’s short life, by truly trying to learn from what happened to her and by ultimately finding ways to prevent similar tragedies from occurring to others. With all of this being said, I would like to genuinely thank everyone who attended and let them all know how sincerely grateful I am for their continued support of The Emily Jerry Foundation, as well as, for me personally. Below are some high-resolution scans of the official program from the event. Click on the images to view them larger and/or download the files.